Work the World was recommended to me by my course at my university, and it seemed like the best and easiest choice: everything was included, such as food and accommodation, the entire placement is planned for you, and I just had to book my own flights! When I first started third year, we were given a presentation about Work the World and I decided to go for it. 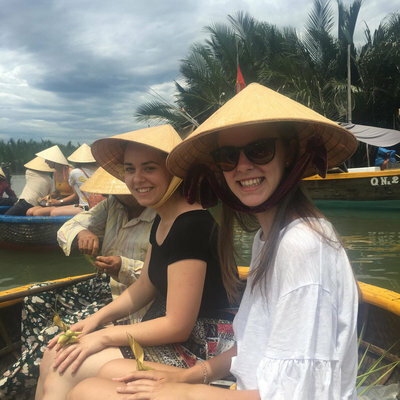 I received a grant from my university, Bournemouth, called the Global Horizons Fund, which meant that my flights were covered, as well as some of my other expenses, which made a huge difference to the overall cost of the trip. 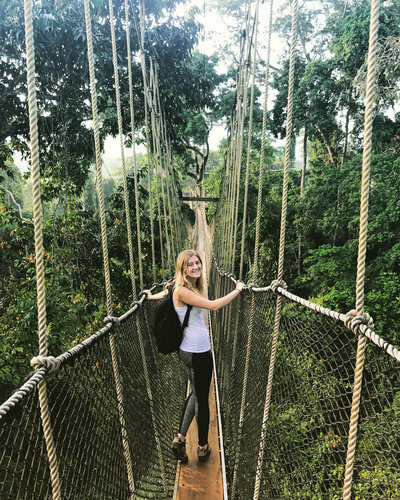 I chose Ghana as I wanted to go to Africa, and I’d never been before – I thought it would be the best time to experience the country for what it really is, and get a real feel for a different culture away from home comforts. We flew from Heathrow in the morning, stopping in Amsterdam on the way, and we landed in Accra at nine in the evening. My first thought was that it was really hot – I couldn’t wait to shower! Frank, the assistant programme manager, met us at the airport arrivals lounge, and we were so glad he was there, as the airport was very hectic, with loads of people crowding around and trying to offer you a taxi! Fortunately, Frank had met us right away so we knew we were in safe hands. That evening we stayed in a hotel in Accra, where we had a much needed sleep and recovered from a day of travelling. The next morning, we went to local bus station and Frank took us on the coach to Takoradi, which took 4 hours. When we arrived in the afternoon, we had our lunch with all the students that were there already, and relaxed by the pool! I absolutely loved the house! It was huge, and there were seven others in the house when we arrived so we had loads of space to ourselves. The pool was a bonus, especially when you’re hot from travelling, it was always first thing I did when I got back from placement. The garden was really well kept and a relaxing place to wind down. We had our city orientation with Frank on the Monday, who showed us around the hospital and all the departments. It was very different from UK – the wards are a traditional layout, long and straight, whereas UK we have bays and there’s usually 6 patients in one bay, whereas this was around 20 across a long room. The A&E (where I took my placement) was a lot smaller than the one in the UK. The staff were really friendly when we were shown around, and the nurses were very welcoming. You have to make sure to ask lots of questions and show interest in the staff and patients in order to quickly become part of the team. I saw a lot of children in road traffic accidents, more so than I would see in the UK. I also noticed that the road accident patients didn’t arrive as “cleaned up” as they would be in the UK, as the paramedics don’t have the time or resource before they bring them to A&E. I definitely found the malaria, TB and cholera cases particularly interesting – as I had never seen these at home – someone even came in with a monkey bite. There were definitely visible differences between Takoradi and home. They don’t respond to emergencies with the same urgency that we do, which I had already been told about, but it’s certainly a cultural difference, as the Ghanaians seem very calm in day-to-day life. Another difference was how the staff and next of kin dealt with death, outward emotions weren’t displayed quite the same. As a nurse, you’re also not expected to provide emotional support for physical injuries, such as comforting someone in pain. These are cultural differences and something you must respect as a guest. 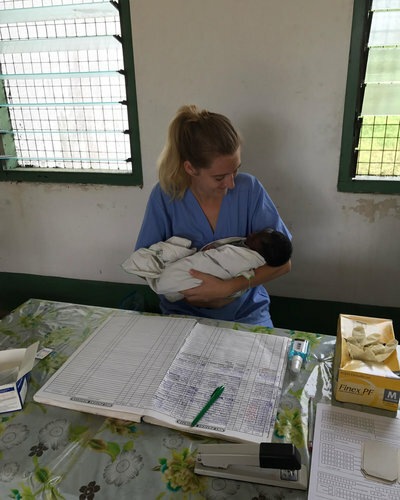 The staff’s resourcefulness was a huge eye-opener: we reused things like oxygen masks (disposable in UK – normally one per patient or staff), whereas in the hospital there was one adult sized mask and one child sized mask for whole department, and it would be reused. Patients with broken bones would have their breaks set with blocks of cardboard. My day-to-day tasks were a mix between observational and practical – the staff are very accepting once you show willing and interest. The first week in A&E was very observationally based, but later on I could help triage the patients and provide the doctor with an assessment, including the urgency of their case and then also observe them whilst they were in A&E, all under supervision. 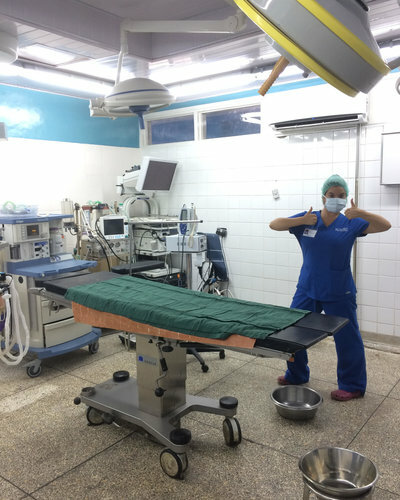 My placement in Ghana definitely made me more resourceful, and I have a far greater awareness of the cost of things we use in hospital at home that seem disposable. I also gained a greater appreciation for my home healthcare system and the choices it offers patients and staff. It was very insightful to see patients with malaria; I am now more confident in spotting the signs, so I definitely learnt practical skills as well as cultural. There were also emergency situations, including a cardiac arrest, which I had never seen before. I feel more confident in reacting to emergencies, something which will certainly help me in my future career as a nurse. Back at the house, we had a weekly language lesson with a local teacher, which was really helpful, and I picked up a few phrases, including all basics. We learnt the important phrases that you’d need in the hospital, and we thought the teacher was excellent at allowing you to ask questions and make the most of the lessons. The evenings after placement were usually spent at the pool, or going to Market Circle in Takoradi and doing some shopping. A couple of times we also went to the café down the road. On weekday evenings we didn’t do too much, as we wanted to chill out after placement, but often a group of us went for meals and drinks and sometimes we’d have movie nights at the house. Our first weekend in Ghana, we went to the stilted village, Nzulezo – in a canoe which went down the river. It was very interesting to see a different way of life in rural Ghana. We also went to Africa Beach, which was lovely. 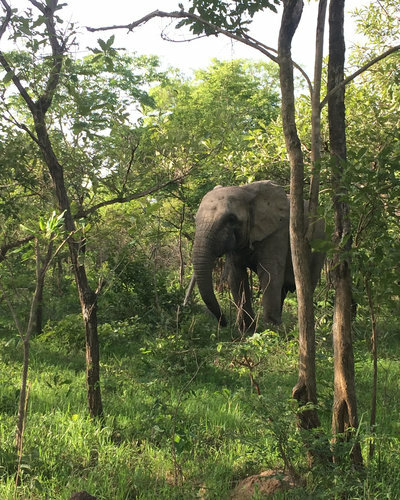 One weekend myself and a friend went and did a safari at Mole National Park, it was a long day of travelling, but it was definitely worth it. We saw beautiful elephants, baboons, warthogs, antelope and many more animals! My favourite memory was actually seeing an elephant because I just wasn’t expecting it – it was truly amazing to see. When it came to planning weekends, Frank and Joe, the Programme Manager, were really helpful, they know everything there is to see and do around Takoradi! We also got a lot of tips from the girls who were staying at the house already, as they’d already been there a few weeks. 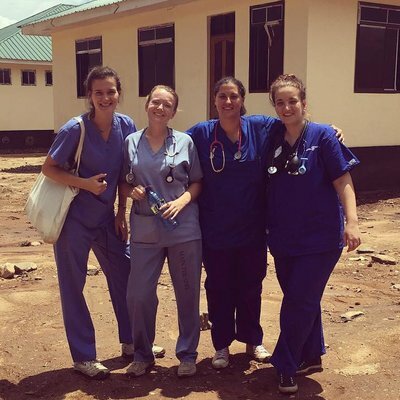 In the house with us was one nurse from New Zealand, two physios from Scotland, some adult nurses and a pediatric nurse from Bristol, as well as a medical student from Manchester. There was a really good mix. The food at the house was really good – the caterers always took comments on board about what we wanted to eat, and would make the foods we loved on request! We really enjoyed all the food they had cooked for us, and they’d always check to see if we were in at the weekends and they’d leave us leftovers. My favorite thing about Ghana was how beautiful it is, although it is a developing country it is good to be prepared for the differences. The locals are super friendly and helpful – they absolutely love tourists and want to meet you. 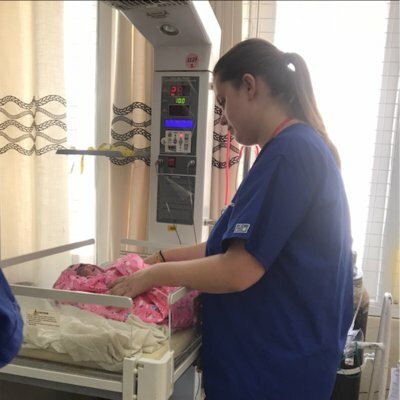 A Work the World placement is definitely worth doing, it’s an investment and hard work, but it’s such a good experience. My advice to anyone considering a trip with Work the World is: make it happen!